A new OS update for the MOTIF XF offers wireless MIDI connectivity with Yamaha’s new iPad applications. After connecting a compatible Wi-Fi USB adapter, you can send and receive MIDI messages between the XF and the iPad. There are new Yamaha iPad applications which expand the features of MOTIF XF including Keyboard Arp & Drum Pad, Faders & XY Pad, Multi Editor Essential and Voice Editor Essential which make it easy to play, tweak, mix and edit your MOTIF XF wirelessly from an Apple iPad. Check out new possibilities of MOTIF on the following page. 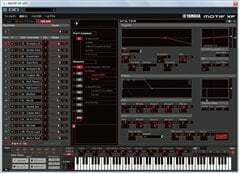 The MOTIF XF boasts a rich collection of instrument Voices that includes piano, EPs, strings, wind instruments, orchestral sounds, guitars, basses, and drums, as well as a wide variety of vintage and modern synth sounds. Of special note are the detailed digital re-creations of two Yamaha grand pianos (a 9' CFIII and a 7' S6) that only an acoustic piano manufacturer could achieve. The reproduction in minute detail of even very subtle nuances results in exquisitely crafted piano Voices that will satisfy even the most demanding players.New waveforms have been added to the MOTIF XF, which now contains a huge total of 741 MB of waveforms.Starting with the S6 piano, the 136 newly-added Voices include keyboard sounds such as those of clavinets and organs as well as a wide range of new sounds from orchestral to hip-hop. This huge internal wave memory ensures that the MOTIF XF is the best sounding and most versatile keyboard workstation right out of the box. The tone generator that the MOTIF XF has inherited from the MOTIFXS makes an 8-element-per-voice structure possible. Combined with Yamaha’s XA (Expanded Articulation), this 8-element structure allows you to achieve stunningly accurate acoustic instruments including expressive articulations that up until now have been difficult to re-create in electronic instruments. For example, you can re-create the natural legato of wind instruments, the key release noises of pianos and other instruments, guitar slides and harmonics, and the many different articulations for string instruments (spicato, tremolo and pizzicato, etc.). The AF1 and AF2 buttons on the front panel make it easy to control Voices with multiple articulations.For synthesizer sounds, the 18 different filter types, advanced 6-stage pitch, filter and amplitude envelopes, unique Wave Cycle feature and assignable modulation Control Sets make the MOTIF capable of reproducing any synth sound from vintage to modern.The tone generator also supports half damper pedaling through the use of the separately sold FC3 foot pedal. Using half damper pedaling with the damper resonance effect, you can achieve an even more realistic and richer piano sound that simulates the sound board of a grand piano and responds naturally to sophisticated piano pedaling techniques. Yamaha’s proprietary VCM (Virtual Circuitry Modeling) technology simulates the effects of vintage EQs, compressors, and phasers at the circuit level. This has enabled Yamaha to increase the MOTIF’s instrument quality by modeling the "texture" of vintage analog compressors, EQs and stomp boxes right down to the component transistors and resistors. With the MOTIF XF, the high-quality effects found in our industry standard digital recording consoles are at your fingertips. Also, the MOTIF XF is equipped with vocoder effects. By connecting a microphone to the MOTIF’s A/D input terminal, you can apply effects to your voice or use your own voice to create harmonies. The MOTIF XF also includes the award-winning "REV-X" reverb, the same professionally renowned reverb found in the SPX2000. The MOTIF XF6 and XF7 use high-quality FSX keyboards with 61 and 76 keys, respectively. 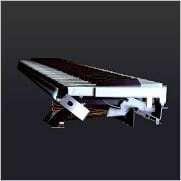 The MOTIF XF8 uses a BH (balanced hammer) keyboard with 88 keys. The FSX keyboard uses a newly-developed mechanism to provide a smooth touch that is both comfortable to play and responsive to your touch. It’s easy to play fast passages, including glissandos and trills. It is also worth mentioning that the keys are very quiet.The balanced hammer keyboard is filled with the know-how and technology that Yamaha has developed producing full concert grand pianos and stage pianos. To make a keyboard with a piano touch that can still work comfortably with any voice, we took a graded hammer keyboard, which is a popular keyboard for electronic pianos, and adjusted it for use with a synthesizer: we balanced the keys to the same weight and made adjustments so that the synthesizer can support after touch and other features. While pursuing the real touch of a grand piano, we also provide a touch that is exceptionally suited to the performance of a multitude of synthesizer sounds. You can use the arpeggiator to perform unique instrument phrases. By layering parts, you can give form to your composition ideas quickly.The MOTIF XF excels in both arpeggio quantity and quality. In addition to typical arpeggio patterns, the MOTIF XF also features simulations of acoustic instrument performances through the combination of arpeggios and the keyboard MegaVoices (example: video) and arpeggios in which synthesizer parameters, such as panning and filtering, are modulated in time MIDI clock. The MOTIF XF adds to the MOTIF XS’s extensive library of arps and has an additional 1,248 synthesizer, drum, percussion, and ending arpeggios, for a total of 7,881 types of arpeggios. In performance mode, you can layer up to four Voices, and you can split the keyboard into 4 zones with different key ranges and velocity windows. Also, you can create music quickly by using the arpeggiator on the different Voices. The MOTIF XF interactive real time arpeggio engine lets you run 4 different arps simultaneously and switch between 5 different variations of arpeggio patterns in real time. It’s incredibly musically interactive and many arps include chordal intelligence so they create different phrases depending on what chords are played on the keyboard.Thanks to the direct performance recording feature, which enables you to record performances in real time to songs and patterns, you can quickly capture your song ideas sparked by the MOTIF Performances to a song or pattern for further editing and refining. You can use the Category Search feature to quickly and easily select the Voices or performances from the MOTIF XF’s massive arsenal of sounds. All the Voices in the MOTIF are categorized by instruments and even have sub categories. So it’s easy to select Category Search, choose the category strings, the sub-category ensemble and then see all the ensemble string Voices in your system. Even third party libraries are categorized using this elegant database system. Category Search is available wherever you want to select a Voice, so when you are looking for just the right sound in a Song, access Category Search and easily browse for that perfect fit for your mix.In Performance Mode, Performances are sorted by musical genre, so you can quickly select the type of Performance that matches your moment of inspiration. The Favorites feature even lets you tag your favorites Voices and Performances so they are even easier to access. The MOTIF XF has 128MB of internal SD-RAM. 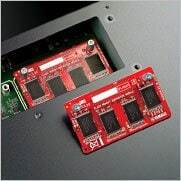 This means that you can sample external audio without installing separately purchased memory. Using the sampling feature, you can load sample Voice libraries, import WAV files or add vocals, guitars and other acoustic instruments to your MOTIF sequences.You can connect a microphone to the A/D input and sample vocals Also, if you select the slice feature during sampling, even if you change the tempo of songs and patterns, recorded audio will follow the beat with perfect synchronization. You can process your recorded samples in minute detail to produce just the right sound using a redesign sample editing UI. The MOTIF XF features an Integrated Sampling Sequencer which allows you to combine MIDI and audio samples (driven by MIDI events), so you can create complete songs including vocals, guitars and acoustic instruments all right inside the MOTIF XF. Because the XF now features 128MB of onboard sampling RAM, you’re able to take advantage of these powerful features right away without the need to purchase external memory. The XF sequencer also lets you work the way you prefer because it features two different sequence modes. There is a linear tape machine-style, 16-track Song sequencer for recording and punching in and out as you would on a tape machine-style DAW interface. It also includes a 16-track Pattern sequencer that lets you work in loops and build up sections of your song (verse, chorus, bridge, etc.) and chain those sections together into complete song structures. You can easily move your production back and further between song and pattern modes depending on your needs. With the bundled Cubase AI software, you can even import completed Songs directly in Cubase including all the audio samples for further editing and mastering.• Integrated Sampling SequencerWith the Integrated Sampling Sequencer, you can integrate audio (sampled) data and MIDI data seamlessly. WAV/AIFF loading is also supported. You can use the time slice feature to slice the sampled sounds that you load and control them in the same way that you would control MIDI data. For example, you can synchronize audio data to the same BPM as MIDI sequence data. Also, by presetting the tempo, time signature, necessary number of measures, and number of beats, you can smoothly perform trimming and easily create perfect audio loops. Also, you can use a variety of editing commands to modify your samples. The MOTIF XF supports features such as time stretching, in which the sample length is changed while the pitch remains the same; pitch shifting, in which the pitch is changed while the length of the sample remains the same; and loop remixing which instantly creates new musical variations of looped grooves. In addition, there is a resampling feature that you can use to record the performance of the MOTIF XF as a single audio sample. 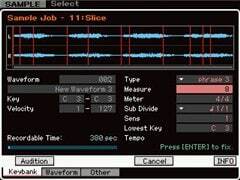 Features such as remote control (which you can use to remotely control the parameters of a DAW application on a computer from the MOTIF), various DAW templates, and simple setup features make the MOTIF XF easy to use. In particular, the integration between the MOTIF XF and Steinberg’s Cubase 5 series is truly seamless.Using the Yamaha MOTIF XF Editor, you can make subtle Voice edits from your computer while checking them visually. Because the communication between the MOTIF and the editor is bi-directional, whether you’re moving the knobs on the MOTIF or changing parameters with the mouse in the editor, the parameters are perfectly matched. There is even a VST3 editor for use in Cubase 5 (including AI) which lets you use your MOTIF as a VST soft synth.If you install the optional FW16E FireWire expansion board, you can record 16 tracks of audio data to the DAW software through the audio interface. After you install the necessary drivers (AI driver, extensions for Steinberg DAW), connect the MOTIF XF to a computer using an IEEE 1394 cable, and start Cubase AI. It identifies the MOTIF XF’s audio I/O and multi-sound source immediately, and all you have to do to start working is select a MOTIF XF project template. The MOTIF XF comes with a special Yamaha version of Cubase, the world-renowned DAW software. 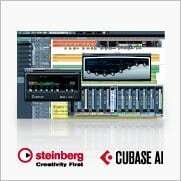 Cubase AI has the same engine as Cubase 5 but has been modified to integrate more efficiently with the MOTIF. An improved User Interface with many user requested features like Tap Tempo, Drum Editing in Mix Mode, and Auto Mapping of samples* plus a new customizable UI for selecting your choice of color and positioning of key displays. *Need to update MOTIF XF OS to V.1.10 to use this function.